A new version of a proven clean, low energy, highly effective cooling water management product range has recently been launched. System UVEX® produces UV treatment systems that are highly effective in treating the water for cooling, water features and humidifiers as well as rainwater harvesting without using multiple chemicals. The system it is not only effective in helping prevent waterborne problems such as Legionnaires’ Disease but it does so in way that is cleaner, greener and cheaper than traditional systems. The first System UVEX® products were launched in 1989 offering a cost-effective and highly sustainable means of ensuring buildings are safe and free from any threat from unwanted bacteria. In addition to the existing benefits, the latest products in the range offer improved monitoring with signal outputs for real-time and historic observations; controls that are self-adjusting in reaction to the demands of the building; and true duplex treatment to guarantee in-built back-up. System UVEX is a British invention and is made in Hertfordshire. The product works by killing the Legionella pneumophila bacteria and other bacteria with UV light making buildings safe without using multiple chemicals. Importantly, it controls the blow-down (or bleed cycle) and responds to the demands of the building in real time. System UVEX enables building managers to be ACoP L8 and also HSG274 compliant whilst avoiding the hassle and cost that comes from dosing with traditional chemical systems. System UVEX is a member of the Legionella Control Association and UVEX works by filtering the water to at least 25 micron before emitting intense UV light into the water as it passes. For back-up an advanced timed (low usage) bromine dosing system also forms part of the package. Monitoring of the UV intensity, together with redox control of the dosing, allows a constant assessment of the effectiveness of the treatment. However what makes the new UVEX different is the control itself. The UV and dosing outputs are constantly processed by a PLC in the main control panel. This enables a very precise setting up of the UVEX which vastly increases the accuracy and reliability of the water management. The result is a clean, safe cooling tower and peace of mind for the building manager. 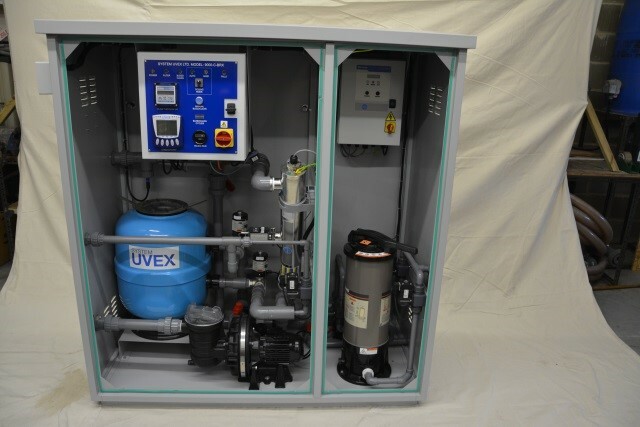 There is a System UVEX option for any size or type of water cooling system. System UVEX has been installed by a number of major clients including city banks, shopping centres, museums, galleries, cold storage facilities, automotive firms, power stations, utilities, food manufacturing plants and food retailers, hospitals, hotels and industrial plants. Estimates are that these firms enjoy considerable cost savings as well as contributing to their sustainability claims as the system avoids the usual high levels of chemical dosing associated with traditional systems.